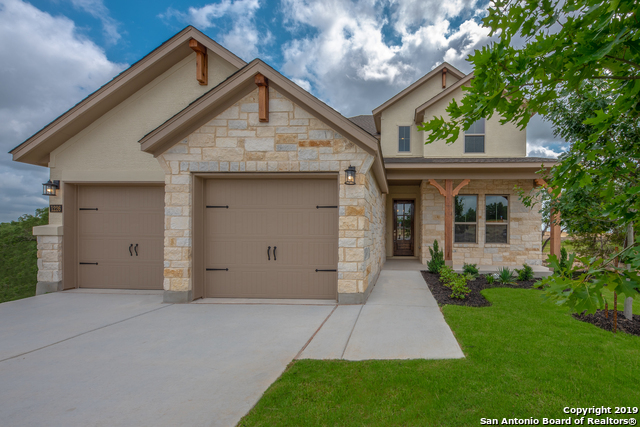 All KINDER RANCH homes currently listed for sale in San Antonio as of 04/24/2019 are shown below. You can change the search criteria at any time by pressing the 'Change Search' button below. 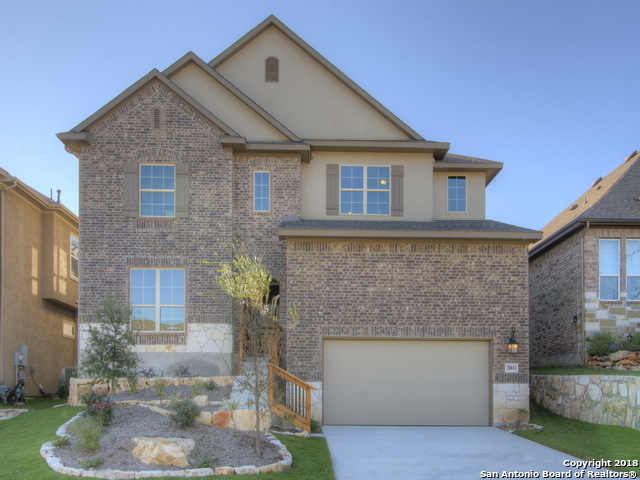 "Custom Monticello Home in Kinder Ranch. 40K in builder upgrades including wall to wall sliding doors for true indoor/outdoor living. In addition owner added hardwood floors throughout entire home, screened in 400 sf patio, & 15K in custom high end LED lighting in every room. 4/3/3 in over 3100 sf. Dramatic soaring ceilings feat wood beams, floor to ceiling stone gas logged fireplace and floor to ceiling stone wall encasing the commercial gas range. 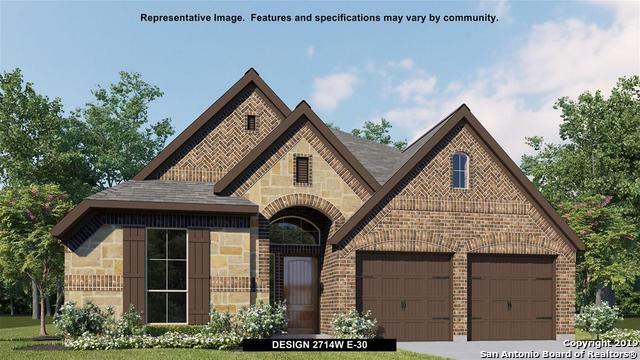 Two flex rooms could be game rm, formal dining"
"New construction Monticello Home. Great 2 sty open plan with 4 bedrooms 3 Baths plus Game Room, formal dining + breakfast area, 3 car garage. Great kitchen. Comal ISD." "Exquisite single story home located in the coveted Kinder Ranch neighborhood. Fabulous curb appeal will greet your buyers as they enter into this fantastic and well appointed abode. 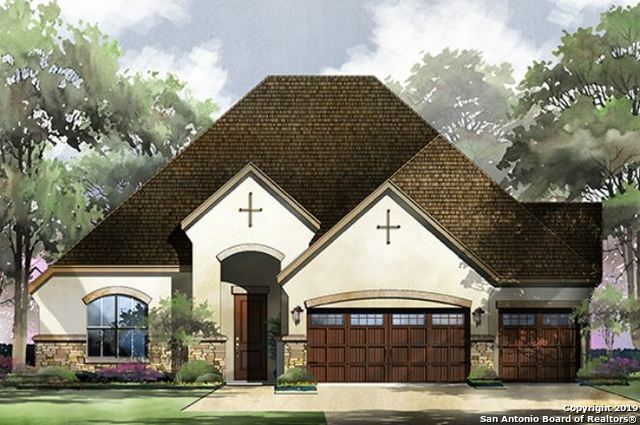 The considerable open floor plan can accommodate family, friends, large gatherings and more. The kitchen blends seemlessly into the family room & offers an oversized island, double ovens, granite counters & stainless appliances. Generous master retreat and secondary bedrooms. Large covered patio overlooks the massive"
"New construction Monticello Home. Great 2 sty open plan with 4 bedrooms - Study, Game Room, 3 Baths and 3 car garage. Great kitchen. Comal ISD." "New construction Monticello Home. Great 1 sty open plan with 3 bedrooms 2 Baths and Study plus 2 car garage. Great kitchen. Comal ISD." "4 bedroom, 3 bath, 3 car garage and media/game room on one level. Extended covered patio entertainer kitchen with stainless steel appliances, double ovens, 36 gas cooktop and granite countertops. Tile in living areas, wood floors in Master." "New construction Monticello Home. Great 2 sty open plan with 5 bedrooms 4 Baths plus Game Room, formal dining + breakfast area, 3 car garage. Great kitchen. Comal ISD." 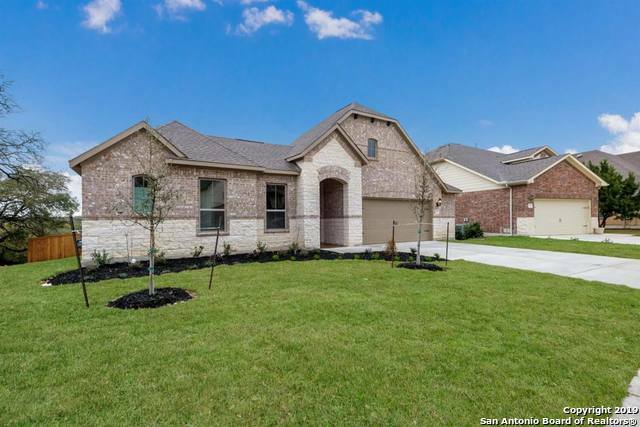 "THIS 3 BEDROOM/2 AND A HALF SITTERLE HOME IS BEAUTIFULLY LANDSCAPED AND SITUATED ON A GREENBELT WITH MATURE OAKS. THIS SITTERLE HOME FEATURES AN ENTERTAINER KITCHEN WITH LARGE ISLAND, BREAKFAST AREA, NEW, TOP OF THE LINE, BUILT IN STAINLESS STEEL APPLIANCES, AND DOUBLE OVENS. THIS SITTERLE HOME HAS LARGE BEDROOMS, WALK-IN CLOSETS, A FIREPLACE IN THE GREAT ROOM SURROUNDED BY BUILT-IN SHELVING, A LARGE PANTRY AND UTILITY ROOM. 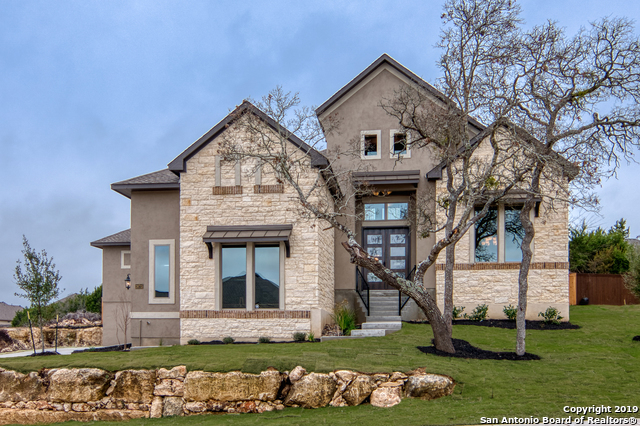 A MUST SEE SITTERLE LUXURY HOME IN THE HIGHLY SOUGHT AFTER KINDER RANCH"
"This home has it all! 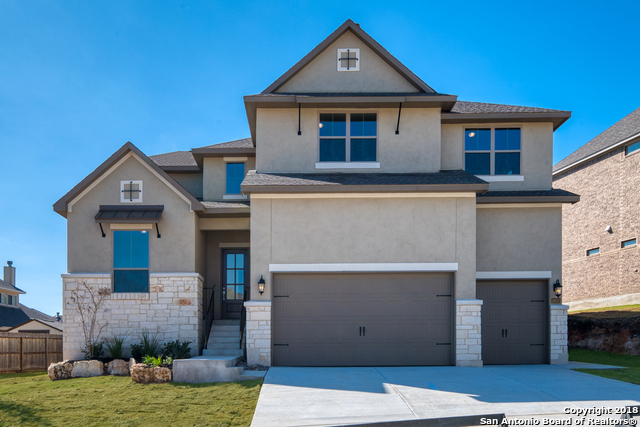 Stunning 2 story open design with study, formal dining, awesome gameroom, 4 bedrooms, and walk in closets. Lots of upgrades to include extensive tile flooring, 8 ft Speakeasy wood front door. 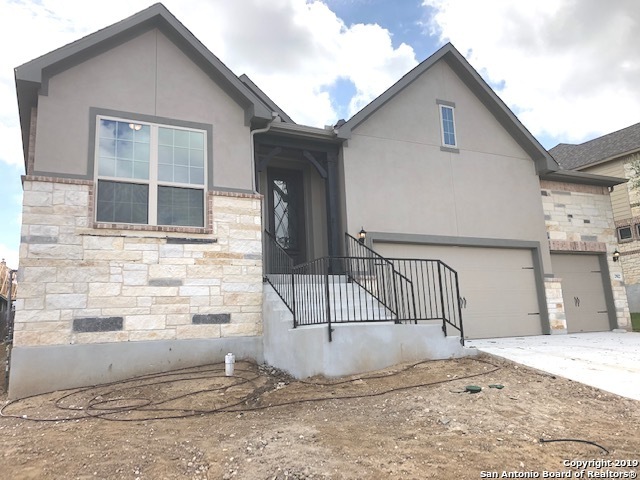 Stainless steel appliances with double convection oven, 5 burner gas cooktop, Silgranite kitchen sink, granite countertops in kitchen and baths, oversized walk in shower in master with freestanding separate tub, separate vanities with granite and under mount sinks. Exterior boasts a l"
"If you are looking for a large home on a large lot, look no further. 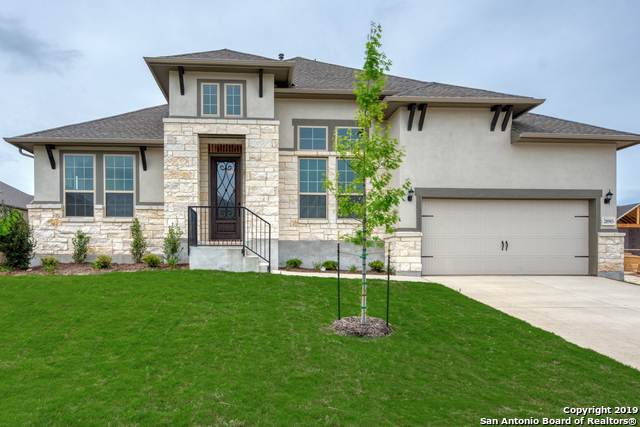 This 5 bedroom, 4 bath, plus study, Sitterle home is all that and more. Huge kitchen has tons of cabinets, large island & gas cook top. Second bedroom down is ideal mother-in-law/guest suite. All downstairs is tiled, no carpet. Upstairs you have 3 bedrooms and large game/media room. 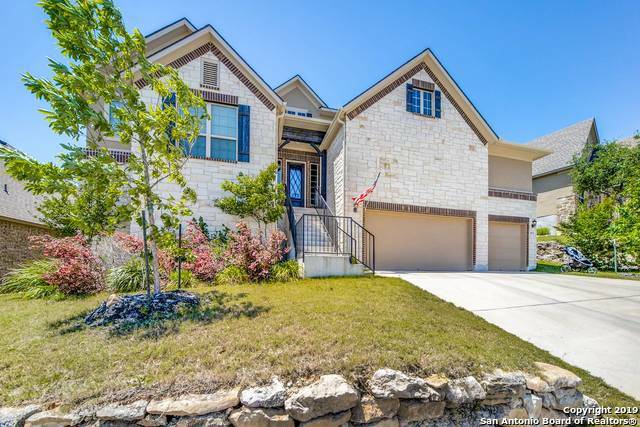 3 car garage, sprinkler system flagstone patio & fire pit in back yard. Elementary, & Middle School nearby w/new High School to open soon. 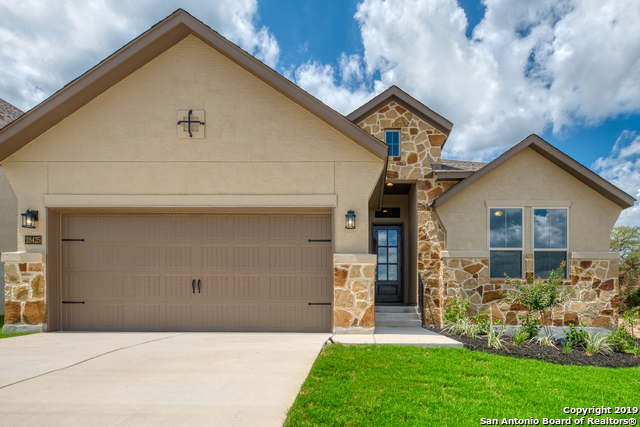 Lots of "
"Beautiful Milam floor plan, same as the model home located on a corner homesite. Spacious, 2,999 sq. 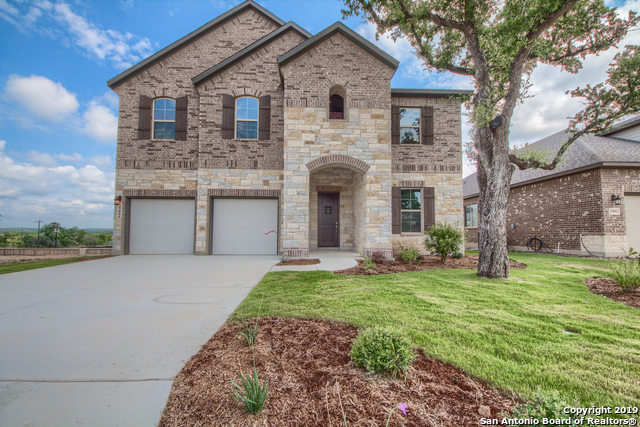 ft. one story home with an extended foyer opening to the spacious dining room and a private study. As you enter the family room, you will enjoy the openness of the gourmet kitchen with double ovens and gas cook top and the breakfast area. The family room features a fireplace, and high tray ceiling with double doors that open on to the patio. Secondary bedrooms share a jack&jill bath. 3 car ta"
"New construction Monticello Home. Very open floor plan with 11' ceilings at entry and family with soaring 8' fix glass windows in family room. Featured in the Hill country setting. 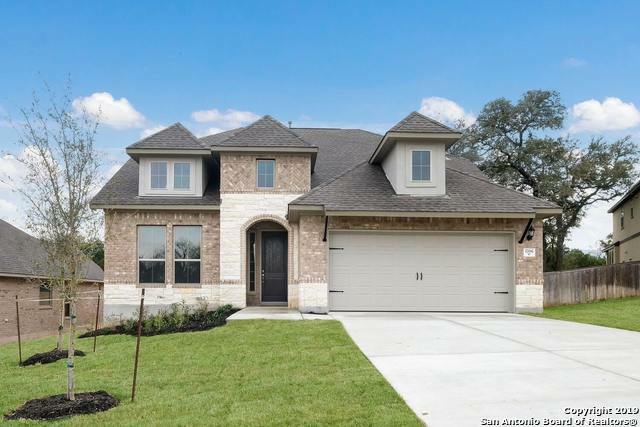 Home has incredible features: Large walk-in shower with separate vanities in master bedroom with two large walk-in closets, tile floors throughout entry, family and kitchen. 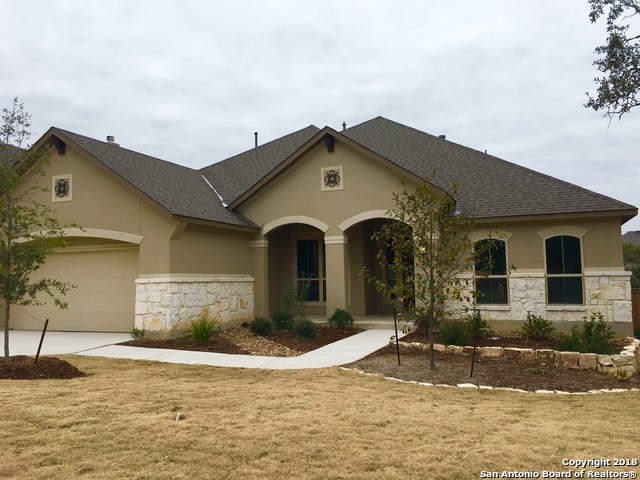 Featuring granite in kitchen with large island and island sitting with beautiful white cabinets, fireplace, quartz counter tops in master with"
"Beautiful home on corner lot in Kinder Ranch. 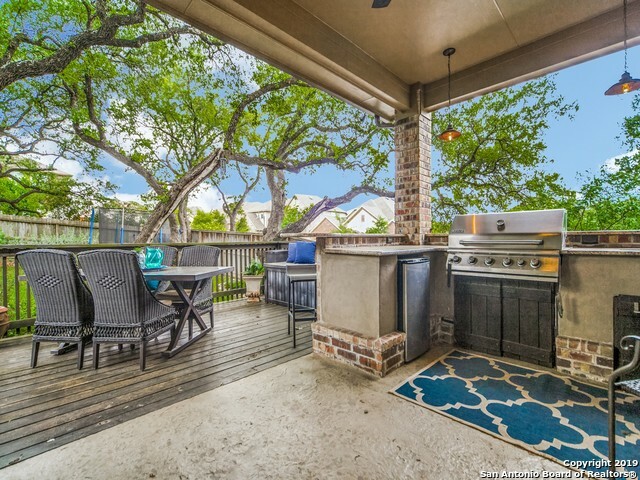 Private backyard w/covered patio, fireplace, TV mount, bar, outdoor kitchen and mature trees. Open floor plan with separate dining, designated office, lofted game room and media room. Gorgeous master bedroom with bay windows overlooking private yard. Kitchen has granite, SS appliances and large island/breakfast bar. Elementary and Middle school in walking distance with new High School to open soon. Please see Assoc. Doc. for upgrades." 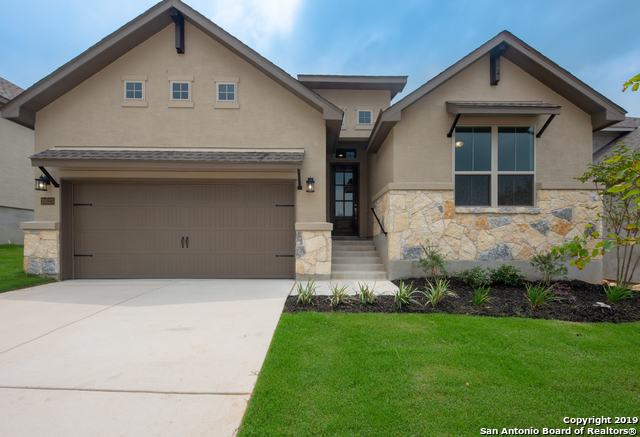 "Situated on a greenbelt home site, surrounded by gorgeous oaks, this spectacular floor plan will captivate you at first sight. 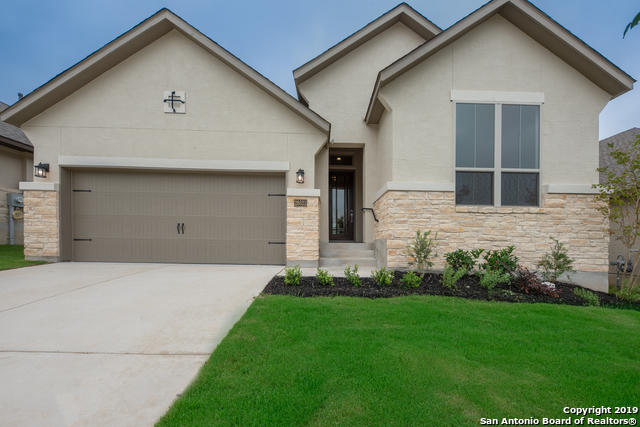 The open air courtyard draws you in where you're welcomed by a beautiful 8' front door and open foyer. The large family room with adjoining kitchen and dining room makes the perfect place to entertain or to enjoy an evening with the family. Two secondary bedrooms and a guest suite allows for plenty of space." "New construction Monticello Home. Great 1 sty open plan with 4 bedrooms 3 Baths plus 2 car garage. Great kitchen. Comal ISD." "New construction Monticello Home. Great 1 sty open plan with 3 bedrooms - Study Plus 2 Baths and 2 car garage. Great kitchen. Comal ISD." "Extended entry with a 13-foot ceiling. Formal dining room. Game Room with French doors. Spacious family room with ceramic tile floor features a wall of windows opens to kitchen and morning area. Kitchen features island with built-in seating space and walk-in pantry. Private master suite. Master bath includes corner garden tub, separate glass-enclosed shower, dual vanities, linen closet and a large walk-in closet. Extended covered backyard patio. Two-car garage." 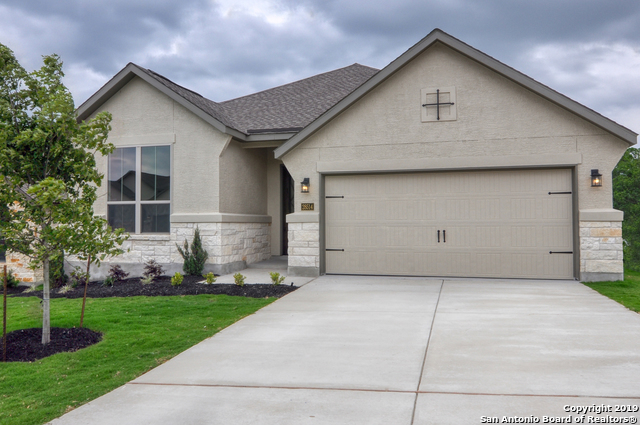 "Gorgeous Ashton Woods Judson floor plan w/ contemporary styling. Notice the quality materials & clean lines as you walk through the dramatic entry. 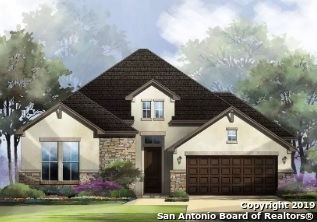 Check out the Gourmet Kitchen w/ 36 Gas Cook top, Double Ovens & Granite counters. Sit & dine at the huge island or the cozy breakfast area. The formal dining rm is being used as a second living area. This versatile home is ready for a new owner to enjoy 4 big BRs plus an executive office, spacious back yard with covered patio. Lots of room in 3-car "
"This lovely home is located on a quiet street with no thru-traffic and the extra bonus of no rear neighbor. The entrance is grand with a 19' tall ceiling and a staircase with wrought iron balusters. There is hardwood flooring throughout the main areas, including the study and formal dining room. The kitchen is decorated with cream colored cabinets and contrasted by glossy tile backsplash. Stainless steel Whirlpool appliances include a gas cooktop. The granite island has kick space beneath to ser"
"Beautiful 2-story Sitterle luxury home in Kinder Ranch. 4 bdrm/4bath. All secondary bedrooms are very spacious. The game room has plenty of space for the whole family to enjoy. The Entertainer kitchen has stainless steel built-in double ovens, 36 five burner gas cooktop, 42 cabinets and much more. This home is scheduled to me move-in ready by May 2018. A must see!!" "New construction Monticello Home. Great 1 sty open plan with 4 bedrooms 3 Baths plus 2 car garage. Great kitchen. Many structural options included! Comal ISD." "Welcome Home!!! 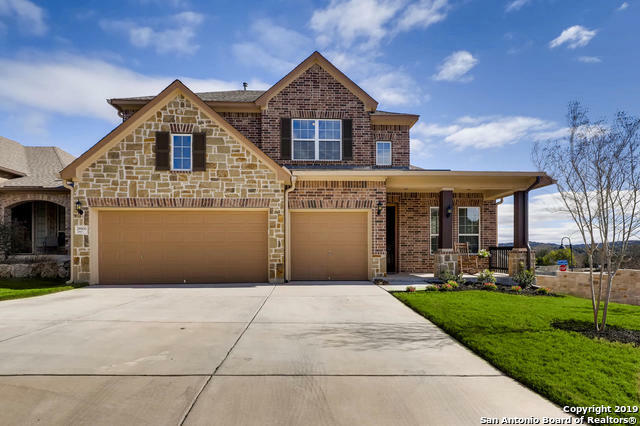 This is a Fantastic 4 bedroom, 3.5 bath David Weekley home on a corner lot. Rich wood floors greet you and continue through to the family room with stone fireplace and island kitchen with granite counters, stainless steel appliances, and gas cooking. Large master suite is downstairs and has a luxurious bath with travertine floors, glass enclosed shower, and tub with large window for lots of light. Study, gameroom, and mudroom. Serene covered patio with bluff views. 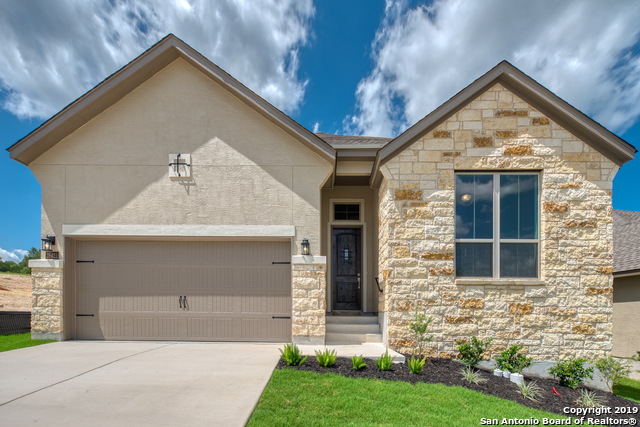 Stone wall in "
"Beautiful one story home with a gourmet kitchen includes a center island, gas cooktop, built-in double oven and a walk-in pantry. Warm, inviting fireplace in family room. Wood flooring in main living areas. Luxurious master suite with private bath including a mud-set shower, garden tub, separate vanities and walk-in closets. Retreat area perfect for a game room. Covered patio for outdoor relaxation. Three car garage."